Stay here until the job is done…there’s room at the table for everyone…this is sacred union at its finest! Let’s begin, as always, by anchoring in our hearts. Feel yourself letting go of the week, letting go of the day, letting go of your to-do list, and feeling all your energy like that pebble dropping into the clear pond, dropping the pebble into the water, seeing it drift down, drift down into your heart. Just take a moment and feel what it is to simply be in your heart, in your beautiful love center, in your center of One. And from that place at the base of your heart, at the seat of your soul, feel your tri-flame, your bright and beautiful Pink Diamond self. 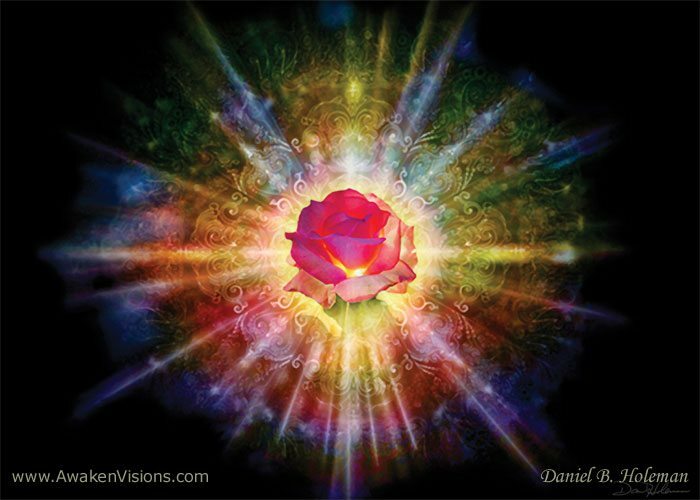 See the purity, the sparkly clarity, the gentle power of that Pink Flame, that Pink Flame that is you, and feel it spiraled around, caressed and embraced by the Mother’s Blue Diamond. See it swirl around…sacred spiral. And on the other hand, on the other side, feel the Gold Diamond of the Father, again spiraling around, intertwining and dancing with the Blue Diamond, connecting with your Pink Diamond. And in this sensation, feel the balance of who you are…of your Divine Masculine, your power, your strength, your wisdom, your courage. And feel the nurturing and beauty of your Divine Feminine, your creator, your nurturer, your healer. And if they feel at all out of balance, simply juice up either your Golden Flame or your Blue Diamond Flame, keeping them equal with your beautiful Pink Diamond Flame. This is your tri-flame…this is essential equipment! Now, put your fingertips together as we go as one circle, one heart, one love, to the 13th Octave. And on the first click…click…feel yourself traveling and going to your sacred temple. I want you to look and feel and sense the parade following you…our Law of Attraction is already underway. All those who yearn for the love and divine union are following you…you’re like the Pied Piper. And you go into your temple where your guides, and guardians, and the masters who you love, are waiting for you, and cherishing you, and joining you in this high vibration. Now, on our second click, you’re going down the steps of the temple and you are being wrapped in the wings and arms of Archangel Gabrielle, and you are going up that golden spiral to the foot of the throne…click…higher…and there is Gabrielle unfurling her wings. She delivers you home and she is passing you into the arms of the Mother, or into the arms of the Father…you choose! As the Mother and Father and you merge…third click…click…into the heart of One. Now, I want you to take this sacred spiral deeper. Feel as if you are literally spiraling in, drilling in deeper and deeper and deeper, deeper than you’ve ever gone before, into the heart of Mother/Father/One. Go. There’s more… Feel that union and feel, just in this unique moment, how you’re dissolving and expanding all at once. This is sacred union…this is sacred union at its finest. 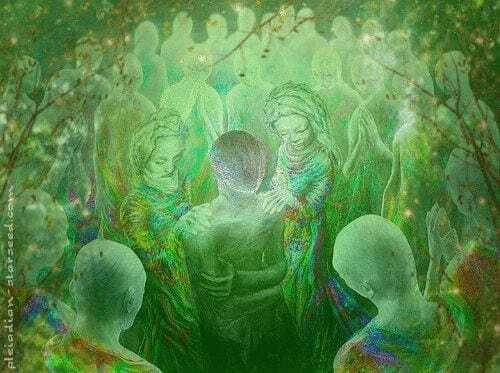 Now staying put,…this is where we practice multi-location…remaining in the heart, deeply embedded in the heart of Mother/Father/One, I want you to drop down that silver cord, that spiral, that red cord, and come with me to the heart of Gaia. Slid down from the heavens, through your body, out your red cord, through the carpet, through the wood, through the tile, through the cement, through the soft earth and the hard earth, the rock, the gaseous layers…keep going until you see Gaia, this ancient, wise woman. Give her your cord, ask her to tend to you, to keep your feet firmly on this beautiful, beautiful planet. See her take it and look into her eyes and see the warmth and the wisdom and the love that she has for you. Now, taking all this energy, come back up through your red cord, through the various layers of the planet, up through your root, through your pubic, your sacral, your tummy, your umbilical, your hara, your halion. Come up into your heart and anchor here. Then as one circle, hand to hand to hand, from Seattle and Bellingham, to Sweden, to Romania, to Italy, to Iran, to New Zealand, Australia, Venezuela, Mexico, the Americas, let’s turn around and face out, face out onto the planet rather than looking inside the circle. Open your heart and start beaming out, with all this energy of oneness, with all this energy of love, no judgment, no restrictions, no nothing, just you and us being one circle of love. Now, lift up your arms as if you’re getting ready and you’re welcoming, getting ready for that big hug, lift up your arms and invite everybody in. Start the stream…here they come! And as you hug them, as you welcome them, as you beam to them our vibration, let them join the circle…let’s make room…bigger and bigger and bigger…let’s go. And if they’re uncertain, just guide them and hold them, even hold their hands, keep one arm out – welcoming – let’s bring everybody in. And in your heart, feel that as we’re growing our circle, as we’re holding the higher vibration, that your heart, the feeling of love, is growing exponentially…that you’re expanding and expanding and it feels incredibly wonderful. And we welcome the tired and weary, the dispossessed. We welcome the abusers and recalcitrants who are afraid to join because they thought we’d reject them…but we don’t…there’s room at the table for everyone. All is forgiven and we teach them how to forgive themselves. Now, with a conscious decision…and this is part of your inter-multidimensional self, of how we work with aspects…I want you to consciously leave yourself in this circle – the welcome committee – holding the highest vibration and welcoming everybody in, and just by their mere approach their vibration goes up, they’re in the music, they’re in the harmony of the love. So, I want us to stay here until the job is done. And then, take a nice deep breath of red, and feel yourself present in your physical body, feet on the floor, in your form and ready to go about our busy day. Tomorrow night, when we do our Peace Meditation at 9:00 wherever you are, I want you to feel yourself coming back to this circle, anchored in the 13th Octave, in the heart of Gaia, in your heart, arms extended and welcoming.